Comments: The green frog is widely distributed across the eastern United States. In Kansas, it can be seen or heard in permanent pools or streams in the Ozark Plateau Region. The green frog resembles the more common bullfrog in coloration. 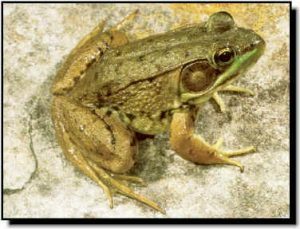 However, the green frog has raised dorsolateral lines extending from behind the eye along its sides. Its call is peculiar and has been described as sounding similar to the twang of a loose banjo string. It deposits masses of eggs that float at the water surface. The young take 2-3 years to mature into adults capable of breeding. Occasionally, green frogs lack yellow pigment and appear to be blue.